's products are rigorously tested to ensure that they meet national and international standards for quality control. 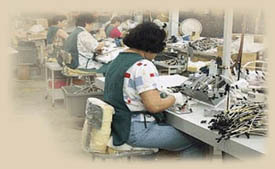 All cable assemblies are 100% tested at both the preliminary and final stages of production, using the industry's latest computer testing. link and because we are providing one of the most important links in our customers chain we are committed to making it as strong as possible. Specializing in the production of both custom and standard cable assemblies, it is our philosophy to produce completely error-free cable assemblies and other related electronic components requiring vertical insert injection molding. ATPI is ISO 9002 and QS 9000 registered. Its registration specifically covers the manufacture of electronic cable assemblies and wiring harnesses, including molded-on terminations. International Co.'s Quality System ensures that all cable assemblies comply to strict procedures, making them suitable for the complex requirements of automotive, medical, communications, robotics and other electronic applications. Our on-going commitment to exerting this level of control over our manufacturing process is our customer's assurance that all of our products meet their demands for extremely high standards combined with very tight tolerances. Because we understand that quality is the ultimate yardstick in measuring manufacturing excellence, our customers can be sure that ATPI's products perform to their specifications.